WIN--------->MOON: latest from kuselan!!! kamal in kuselan??? 'Kuselan' is the remake of the Malayalam chart buster film 'Katha Parayumbol' that starred Mammootty and Srinivasan in the lead roles. The Tamil remake would be a little different from the Malayalam original in the sense of the songs as well as some addition to the scenes. Yes, it is true! We have heard about actor Prabhu essaying a very vital role in this superstar's film. Now there is one more 'mighty' addition to the star cast and Kamal Haasan too will be seen along with Rajinikanth in this multi-starrer film. 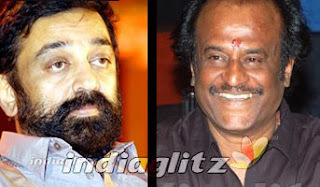 Reports also indicate that Kamal will be seen shaking a leg with the superstar apart from a scene where the two Kollywood supremos would be seen together. The long list of actresses appearing for a song in Superstar Rajinikanth starrer ‘Kuselan’ is still growing, with Trisha and Flora being the latest additions. According to sources, Flora, who is facing a ban in Kollywood following her alleged involvement in the US visa forgery racket is shaking legs for a peppy number in the Telugu version of the film. Suja, the item number specialist of Kollywood is doing the number in Tamil while Trisha, Sneha and Mamta Mohandas are also there.